Imagine the Cardinals opening the season with a starting shortstop who had a career batting average of .217, more than twice as many strikeouts (68) as walks (29) and a reputation as an erratic fielder. That’s precisely what the Cardinals did when they selected Lee “Bee Bee” Richard their Opening Day shortstop in 1976. 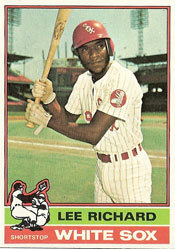 Richard, a speedster, was acquired on Dec. 12, 1975, by the Cardinals from the White Sox for outfielder Buddy Bradford and pitcher Greg Terlecky. The Cardinals projected him as a backup to shortstop Don Kessinger, who joined St. Louis two months earlier in a trade with the Cubs. Nicknamed “Bee Bee” as a hard-throwing high school pitcher in Louisiana, Richard attended Southern University _ the same school that produced Cardinals outfielder Lou Brock _ and converted to shortstop. Scouts were enamored with his speed and strong throwing arm. Richard was a first-round choice of the White Sox in the June 1970 amateur draft. He was the first shortstop selected. “We were fearful he might be picked by the time our turn came,” White Sox general manager Ed Short said to The Sporting News. Richard, however, wasn’t ready to be a big-league regular that season. He committed 26 errors in 68 games at shortstop. “I know some people told me I’d have been better off if I’d go down to the minors,” Richard said. The White Sox did. Richard spent four seasons with them. White Sox broadcaster Harry Caray nicknamed him “The Juggler” because of his poor fielding. The White Sox also tried him at center field, third base, second base, right field and designated hitter. 1. Lou Brock, left field. 3. Bake McBride, center field. 5. Reggie Smith, right field. 6. Keith Hernandez, first base. 7. Hector Cruz, third base. 8. Mike Tyson, second base. After McGlothen retired the first two batters, Bill Madlock grounded to Richard, who booted the ball for an error on his first chance as a Cardinal. The next two batters reached before McGlothen worked out of the bases loaded jam by retiring Manny Trillo on a fly out. Kessinger got the start at shortstop in the next game and he remained the starter until the Cardinals called up rookie Garry Templeton in August. In 13 games, six as a starter, at shortstop for the Cardinals, Richard committed four errors. By July 15, Richard’s batting average dropped to .059. Used primarily as a reserve infielder, Richard appeared in 66 games for the 1976 Cardinals, batted .176 and stole one base. The Cardinals released him after the season and he never appeared in the major leagues again.